St John Vianney's Primary School have partnered with Camp Australia to offer Before and After School Care. This service is offered Monday to Friday during school terms. Bookings can be made on a permanent or casual basis. Start the school day with a healthy breakfast, light activity and relaxation time. Safe environment with planned and unplanned play, outdoor activity, quiet time and a healthy snack. If arranged childen can be supervised doing their homework. 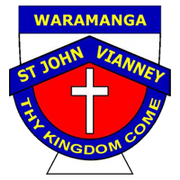 For more information visit the SJV Camp Australia Webpage.